Meet the RED team. They're like the BLU team, only red.note from left to right: Pyro, Engineer, Spy, Heavy, Sniper, Scout, Soldier, Demoman, Medic. Not pictured: Many more hats and other items. "Welcome to Team Fortress 2. After nine years in development, hopefully it will have been worth the wait." Team Fortress 2 is about a group of average, everyday, working-class mercenaries. Some of them work for the heroically-evil demolition company Reliable Excavation & Demolition (RED), founded by Redmond Mann; some work for the evilly-heroic Builders League United (BLU), a construction company founded by Redmond's twin brother, Blutarch. Both MegaCorps are fronts for two opposing intelligence organizations, which each control one-half of the world's governments. Both organizations are given combat intel by the same Administrator, who supplies them with weapons provided by Mann Co. (a company which the twins' father left to the Australian Hale family), which is a subsidiary of The Administrator's own company, TFIndustries. The Administrator is heavily implied to be masterminding the entire conflict, all in a Thanatos Gambit by the brothers' deceased father as punishment for their imbecility. Other developments include Australium, a strange element mined in Australia that turns those exposed to it into manly geniuses, and Gray Mann, the long-lost third brother who's actually not a moron. It was released by Valve in October 2007 as the multiplayer component of the Orange Box, which also includes Half-Life 2: Episode 2 and Portal. It is now also available as a free-to-play (since June 23, 2011 ) download on Steam for Windows, OS X, and Linux. However, because it was first announced in 1998, it was regarded as Vapor Ware for the longest time. Since multiplayer games have a tendency to devolve into slapstick and comedy regardless of their setting, the Team Fortress 2 developers decided to cut the middleman and make their game a living cartoon. The maps would fit right in a typical James Bond novel, the music has a sixties spy movie feel to it, and the characters look like they stepped out of a very violent Pixar movie. Both RED and BLU teams use the same models, with only Palette Swapping to show team affiliation. The characters were intentionally designed to be distinctive as possible, even giving each class its own distinctive accent, making it easy to identify another player's class, weapon, and team affiliation in short order. Maps are likewise designed for easy navigation, with BLU incorporating concrete and steel, RED using wood, brick, and sheet metal, and each team's section being textured primarily in their respective colors. The Control Point gametype works on the premise of seizing territory to shift the focus of battle. Both teams compete for control points—large immovable metal pads — which must be captured by standing on them while no enemies are around. The team who forces their enemies into submission and captures all the points wins. In most control point maps, the points need to be captured in a linear fashion, but some allow a more open-ended approach. Variants include Territorial Control, where the map is divided into mini-maps with two control points each, and Attack/Defense, where RED owns all the control points from the start, and wins if time runs out before the other side captures all the control points. This isn't always as simple for RED as it sounds, because they can't retake control points that BLU has managed to capture, plus BLU gets time extensions for every point they capture. Medieval Mode is an alternative Attack/Defense Control Point map set in a castle in the distant past (the Soldier angered a magician). What makes this mode special is that, like in Terminator, guns (and other weapons too futuristic for the 10th century, except grenades) can't be brought back in time. Thus, all characters can only fight with melee weapons (with the exception of arrows and the like). Unlike Terminator, clothes can be brought back in time because Robin Walker wanted hats to be in the game mode. He wants hats everywhere. Currently, there is only one official map in this mode. In TF2's take on Capture the Flag, the flag is a large briefcase containing "enemy intelligence," which trails papers behind it when an opposing player carries it. Unlike many other games, one can score while their own team's intel is not in the base, and touching dropped friendly intel won't immediately send it home. Instead, it must be defended in place until a timer elapses, during which any opponent can pick it up again. Mannpower is a variant of Capture the Flag. Its most notable features include powerups and a grappling hook for all classes to use. The rules are slightly altered. Like many other games with Capture the Flag, the intel must be in one team's base before the other can capture, and touching a dropped friendly intel sends it back to the base. Random critical hits on non-melee weapons are disabled, melee weapons are 30% stronger and respawn times are much shorter (2 seconds). Capture limits are significantly higher, requiring seven captures to win compared to three for normal Capture the Flag. In Payload, a mine cart with a bomb on it sits on a track. Attacking players (again, virtually always BLU) crowd around the cart to push it along the track towards the enemy's base. The more players present, the faster they can push.note (albeit with a 3x limit for balancing — meaning the fourth player onwards provides no additional boost) The cart must pass through several segments of the map for the attackers to reach the end point. If the attacking players fail to push the cart for 30 seconds, it will slowly move backwards or roll back down hills until it is pushed again or reaches the last checkpoint passed. The defenders win if they can manage to hold back the cart for a certain length of time, though unfortunately for them, the attacking team gets a time extension for every checkpoint reached, and the cart contains a level one dispenser. Payload Race is a variation of Payload, introduced in the Sniper/Spy update, that is Payload times two: Both teams have a bomb, and the first team to get their bomb to the other team's base wins. Things get crazy when you factor in the little fact that each team can interfere with the other's progress. This has a tendency to stall if the two carts end up adjacent, as the lines tend to criss-cross and meet at bottlenecks and tunnels. Furthermore, unlike in standard Payload, there are no checkpoints and carts only roll backwards if unattended on a hill or ramp, which sends them to the bottom. Arena puts the two teams in a much smaller map, with little-to-no health packs or water, and no respawns. Last team standing wins. After one minute, a single control point in the center of the map activates, and the round ends when it's capped if the other team hasn't been killed yet. Fast, frantic fun. King of the Hill is arguably a variant of Arena, using similar small maps built around a central control point, where the teams work their way up to the middle of a map to a point that is initially locked. After a short amount of time, it becomes available and the team that captures it has to defend the point for 3 minutes. If the enemy team recaptures the point, the other's timer freezes; it counts down again if once again recaptured from that time. Unlike Arena, players can respawn. Special Delivery is a mode that could be considered a combination of Capture the Flag and Payload. The objective of this game is to transport a suitcase full of volatile Australium to the space shuttle of Poopy Joe, the all-American monkeynaut. Naturally, the enemy team wants to deliver the Australium as well in order to "make history", and you have to ride an incredibly slow elevator to reach Joe's rocket. Good luck. There is currently only one official map with this mode: Doomsday. Mann vs. Machine is a 6-player co-op defense mode. Here, RED and BLU must team up and take down massive waves of robots (which drop money when defeated) in order to keep the robots from blowing up Mann Co.note In-game, however, only RED team is playable, with the robots being BLU. The robot horde is armed with basic stock weaponry, but there are special robots with unique capabilities (mostly due to their loadout) and a giant robot every now and then. There are six* seven if you count the reskin map Ghost Town official Mann vs. Machine maps, each of which have a variety of missions. Player Destruction is a mode introduced in the Invasion update. In this mode, every time a player dies, they drop a map-specific pickup item* a beer bottle on Watergate, their soul on Pit of Death and Cursed Cove, and a bucket of gibs on Monster Bash that can be picked up by any other player. If a player is killed while holding one or more pickup, they drop those in addition to the one standard pickup. The player on each team with the most pickups (the first to reach that number if tied) becomes "team leader" and acts as a dispenser, but has a number above their head (indicating the number of items they're carrying) that anyone can see, even through walls, making them a target for the enemy team. Every so often, a control point opens up, and the players have to deliver their pickups to the control point while blocking the other team from doing the same. The first team to a predetermined number of pickups delivered (depending on the number of people playing at the start of the round) wins. Robot Destruction is a unique mode currently still in beta, and is limited to one official map. Each team starts with three tiers of defenseless robots in their base, which must be destroyed for their collectable Power Cores until one team acquires enough. However, players also have the power to steal the enemy's points by holding the reactor core spawn area; holding the area for longer means more points will be stolen. This mode, along with its first map Asteroid, debuted as part of the Mann Co. Beta Maps program, an in-game beta test function. PASS Time is a unique mode. It is a blood sport compared to hockey, basketball, and soccer. Conflict takes place over a "jack," a ball-like spike-studded contraption. Carrying the jack replaces the holder's weapons and marks them for death (causing them to take more damage), but gives him several helpful boosts, such as health regeneration, brief invulnerability and speed boost, and the ability to see all players on the map. Jump and boost pads are included to help players reach the other team's goal. 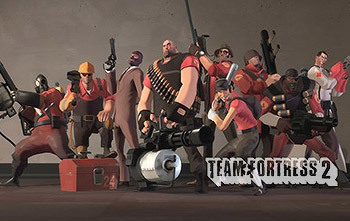 All nine characters (In the following order: Heavy, Soldier, Engineer, Demoman, Scout, Sniper, Spy, Medic and Pyro) and one delicious food item (Sandvich, released between the Sniper and Spy videos) have also been introduced in supplementary "Meet the Team" videos . Tropes for specific classes can be found on the Characters page. Valve have regularly added major content updates for free, including achievements, bot support, custom weapons, maps, and balance changes. The Pyro Update introduced the concept of weapons other than the default, which can now be randomly found after a period of time. They (generally) act as a situational sidegrade to whatever function the default weapon performs. The Sniper vs. Spy Update also introduced cosmetics, which drop the same way but at a much lower rate. They don't do anything but look cool, though players like to show off their wealth. With any new update, players can expect a massive Broken Base. In addition to major updates, Valve regularly adds unannounced user-contributed cosmetics and weapons to the PC version. Ports didn't fare too well for console players: Both Microsoft and Sony at the time viewed new content as DLC, and therefore wanted to charge players real money for updates that are free on the PC version, although nowadays both console provider only charges the developers for updates and charging the player is optional, meaning their version was last updated in July 2009. Playstation 3 is trailing even further behind, with the last last update from March 2008. Active servers are hard to find on these versions, as there is much less content avaliable than on desktop versions. For manageability, this page has many separate pages for tropes that fit better under specific headers, all of which can be found at the top of this page.